The toxics are under control and the benzene "toxic plume" story is "exaggerated and inaccurate." Those were the two major messages from Whole Foods execs about concerns over the possible toxicity of the Gowanus site where they hope to open a 64,000 square foot supermarket by Summer '08. They spoke at a Park Slope meeting last night. Sam Haydock, Director of Northeast Environmental Operations for BL Companies, the project designer, addressed the environmental concerns, saying that Whole Foods takes the clean up of the site "very seriously," but added that a Brooklyn Papers story detailing the presence of benzene on a site across the street and on its own property "exaggerated the issue." Mr. Haydock said that there is benzene in groundwater at the Whole Foods site on an "uphill part" of the property. He said the levels are "above state standards but relatively low" and "do not represent a risk to human health." Benzene is a powerful carcinogen and can pose a serious health threat to those that come in direct contact with it or that inhale it in high enough concentrations. "We don't know what the source [of the benzene] is," Mr. Haydock says. The source of the benzene is believed to be a Verizon property next door, and the Whole Foods representatives said that New York State would deal with any remaining problem. "We have no control over the off-site source," Mr. Haydock said. More than 11,000 tons of contaminated soil have been removed from the site, dealing with the "worst of the problems" in the ground under the future mega-market. After a remediation in approved, Whole Foods plans to "remove significant hot spots" that remain, Mr. Haydock says, adding that "no signficant danger to human health" will remain. We could insert a wisecrack here about how we would have expected "hot spots" at the Gowanus Whole Foods to be in the prepared food area where you get your organic seitan stir fry in spicy garlic sauce. Or wonder out loud whether "no signficant danger" is the same as "no danger absolutely whatsoever." But it would be wrong to add snark to an otherwise straightforward account. Interestingly, only 10,000 square feet of the store is above ground, which is significant for two reasons: First, zoning for the parcel only allows 10,000 square feet of commercial space, but doesn't count space that is below street grade, which is where most of the store is. Second, building underground puts that space beneath the 100-year flood plain line and also means that it needs to be sealed with a membrane to prevent contaminants from getting in. 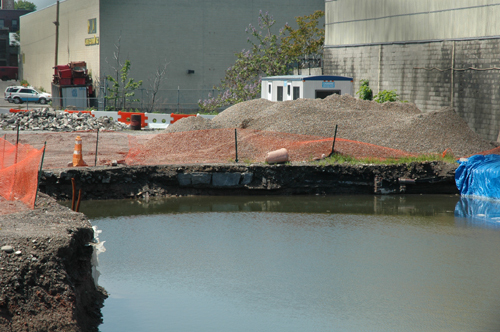 Much of the cost will be born by New York State as part of the Brownfields Cleanup program. In any case, the rest of the site cleanup should begin soon. Just talk to the folks in Greenpoint about this...this is not going to be good and I wouldn't buy my food there. ""Mr. Haydock said that there is benzene in groundwater at the Whole Foods site on an "uphill part" of the property. He said the levels are "above state standards but relatively low" and "do not represent a risk to human health." ""
SOunds like Whole Foods is writing their own standards here. How can the levels be "above state standards" and not "a risk to human health"? State standards are established through very throughtful consideration to all sides of these issues, and set to "protect human health". Such contradictions don't generate community trust. It can make anyone wonder about the organic standards of this store. Please. Whole Foods is not "writing their own standards here." And way to go--you've insulted the people who will be working at this store by insinuating that their standards will be different than the standards at any other organic retailer. Holy Crap: Broken Angel Is a "Development Site"? Is Life in Brooklyn Nasty, Brutish and Short?